Choose the listing category to view by clicking an image below. 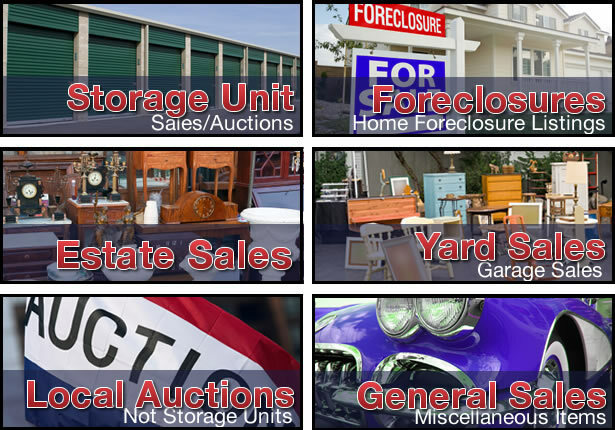 eLegal Sales was developed to be a one-stop "Listing and Locating" search tool for Self Storage Auctions (or "Mini Storage units, bins or lockers" as some say) as well as Estate Sales, Yard Sales and Garage Sales, Foreclosures or distressed Homes, and local Auctions. Also featuring a classified section called "General Sales" to sell or re-sell items purchased in the other categories. This "look-buy-keep-resell" combination for like-minded users has proven to be a big hit amongst our users. Recently compounded by the TV reality hit shows "Auction Wars", "Storage Hunters" and "American Pickers". People now have a growing web based source through "e Legal Sales" to find their hidden treasures. Please help our newer site build traffic by telling your friends (email our link too!) to use our free listings and viewing service. Then together we can expand City-by-City and State-by-State. Thank you from the bottom of our heart! Please email compliments or suggestions through the feedback button at the bottom of the page. Thanks again and "God Speed" from the staff at eLegalSales.com.